Move your website to Shopify in 4 easy steps. Already on another ecommerce tool and want to make the switch? This guide will help you transfer your store to Shopify in four easy steps. I’ll walk you through each of them, so you can move your store to Shopify without any hiccups. First, let’s get your Shopify store built. During this step, don’t worry about your new Shopify store conflicting with your old store. Your Shopify store will be locked behind a password so no one will be able to see it until you’re ready to launch your new store. You’ll control when it becomes publicly accessible. The new store will be built on a Shopify subdomain which looks like this: company.myshopify.com — this means there won’t be any conflicts with your current store, which will still be live on your current url. Traffic and revenue will keep coming into your current store like normal. You’ll sign up for Shopify, find the temporary subdomain (which doesn’t need to be perfect since no one will ever see it) and pick a theme. From there you’ll load your products, build out your pages (About Us and the Homepage), and set up payments. If you’ve never set up a Shopify store before, you may want to stop here for a minute and check out my complete guide on how to create your ecommerce store on Shopify. For some of this, you’ll have to build it by hand. You’ll need to add the elements to the homepage yourself, for example. It’s definitely tedious but once it’s done, you’ll be so glad that you moved everything over. The benefits of Shopify drastically outweigh this one-time transfer. To import your products to your new Shopify store, you’ll go to Products in the admin panel. Near the top there’s a small text link that says Import. There’s a sample CSV — format yours like the sample. Here’s the Shopify walk through of this process. If you get lost, there’s more information in the Shopify Help Center guide to importing products. The process for importing customers is similar. Format your CSV per the guidelines, then navigate to Customers from the admin panel, then Import customers. If you have Shopify Plus, the enterprise version of Shopify, this transfer process is even simpler. You’ll have access to the Transporter app. Shopify Plus only makes sense if you’re a larger business with lots of revenue and thousands of products to transfer over. There are details on which data can be uploaded and how to organize the CSV here. I highly recommend that you also import all your historical customers and order info if you have access to Shopify Plus. Getting all your core business data in one place avoids lots of headaches with reporting later. A few years ago, I was very anti-404. I used to think that every single URL needed a proper redirect and I went a bit overboard on a site. Eventually, our hosting provider reached out and told us that we had too many redirects on our site — we needed to cut them down to 1,500. We had about 2,500 at the time. It is possible to buy a domain directly from Shopify which sets everything up for you. But I’ll assume you already have a domain with another domain registrar since you’re transferring your site to Shopify. If you’re not too worried about the switch, do it on a Monday morning. That gives you all week to fix gaps or put out any fires that come up with the new site. As a general rule, you don’t want to release anything on Friday because if something goes wrong, you’ll spend all weekend trying to fix it. 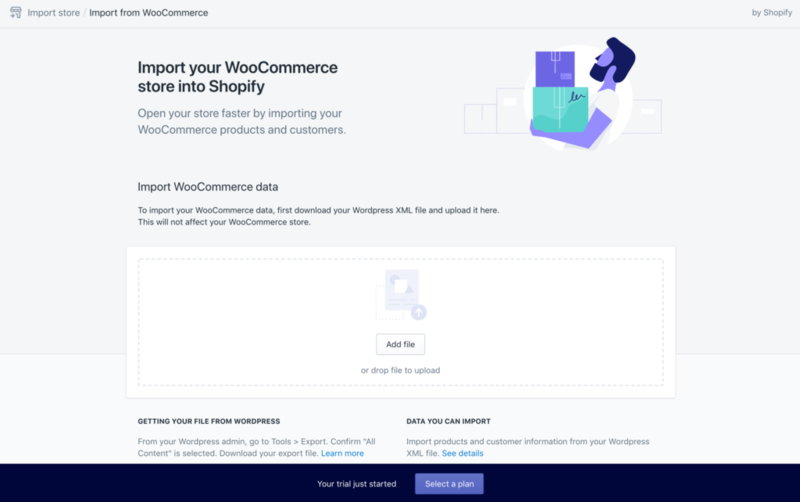 Last updated March 12, 2019: I added in information on how to import your products and customer lists without signing up for Shopify Plus. To import order history, you’ll still need Plus, but the process will still be a lot less tedious with these new steps.